Kiev plans to agree on Russian gas prices and resume talks about a three-party gas consortium to manage Ukraine’s pipeline network next week, the country’s premier said on Sunday. MOSCOW, December 15 (RIA Novosti) – Kiev plans to agree on Russian gas prices and resume talks about a three-party gas consortium to manage Ukraine’s pipeline network next week, the country’s premier said on Sunday. Ukraine, which has few energy resources of its own, relies heavily on gas imports from Russia. At the same time, Ukraine has been a major transit country for Russian gas supplies to Europe. 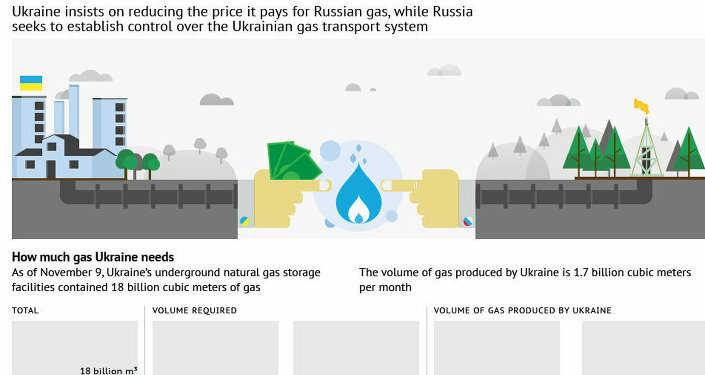 Ukraine has been embroiled in several gas rows with Russia in the past few years over gas siphoning and gas prices, occasionally interrupting supplies to Europe, which gets around a quarter of its gas from Russia. In early 2009, Russia halted all deliveries via Ukraine's pipeline system for two weeks after the two nations failed to agree a price for Russia’s gas deliveries to Ukraine. The gas deal that was eventually signed later that year tied the price for Russian gas to international oil prices, which have since risen significantly, boosting Ukraine's bill. An intergovernmental Russian-Ukrainian commission will convene in Moscow on Tuesday amid anti-government protests in Ukraine. “The sides have come to an agreement that it’s time to settle the [gas price] issue. We didn’t ask for discounts, we discussed only European-level [gas] prices and I hope we would finally resolve this issue during the meeting,” Prime Minister Mykola Azarov said in an interview with Ukraine’s Inter TV. He also said his country was ready to resume talks with Russia about creating a gas transport consortium with the involvement of European partners to manage and modernize Ukraine's dilapidated gas pipeline network. "Another issue of extreme importance for is the resumption of talks about the three-party consortium involving Europe and providing absolutely transparent terms for [gas] transit via Ukraine and for management of our pipeline network,” Azarov said. Kiev and Moscow discussed the possibility of a three-party consortium back in the early 2000's. However, when West-leaning President Viktor Yushchenko came to power in Ukraine, the project was put on hold. The Ukrainian authorities said at the time that leasing out the gas transport network would jeopardize Ukraine’s sovereignty. Ukraine’s refusal to consider a gas consortium prompted Russia to launch the Nord Stream and South Stream gas pipeline projects to pump natural gas directly to European consumers, bypassing transit states. Ukraine’s first deputy premier, Sergei Arbuzov, said the Russian-Ukrainian deals to be discussed at Tuesday’s meeting will be directed “solely at improving our country’s economic security” and none of them envisages the country’s accession to the Customs Union of Russia, Kazakhstan and Belarus.